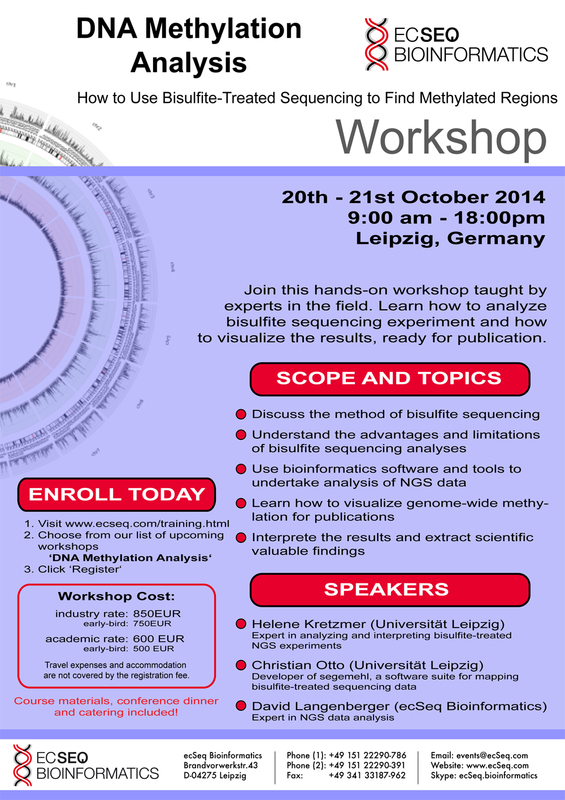 Do you think your skills in sequencing data analysis could need some improvement? 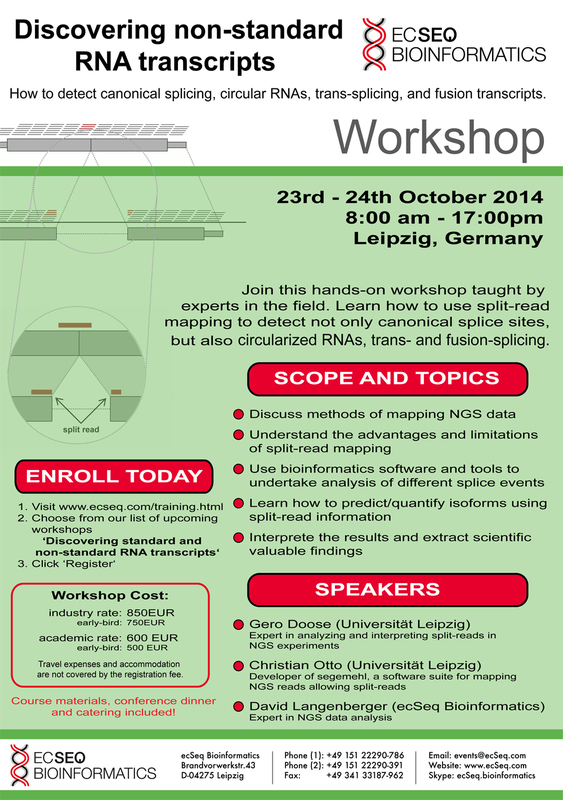 Then our NGS workshop series taking place in October 2014 might be interesting for you. As usual, these hands-on workshops have a strong focus on practical experience meaning that you analyze typical NGS datasets. Our trainers will directly interact with you and give valuable feedback. For beginners, we have the RNA-seq Bioinformatics: A Practical Introduction course which will cover all the basics required for NGS analysis like file formats, quality control, read processing and read alignment, all based on an example RNA-seq dataset. We are very happy that we could convince Dr. Michael Hackenberg, the developer of one of the most-used microRNA gene prediction tools for small RNA-seq data (miRanalyzer) to join us for our microRNA workshop. This course titled microRNA Analysis Using High-Throughput Sequencing will cover the essential steps of small RNA-seq analysis from microRNA prediction to extensive downstream analyses. We also have a workshop on DNA Methylation Analysis where Helene Kretzschmer will show you how she took care of her data in the MMML-Seq study of the International Cancer Genome Consortium (ICGC). Lastly, there is the workshop Discovering standard and non-standard RNA transcripts where Gero Doose will train you on advanced methods of transcriptome analysis. Gero has a strong background in transcriptome analysis, finding different isoforms, fusion-transcripts or circularized RNAs. 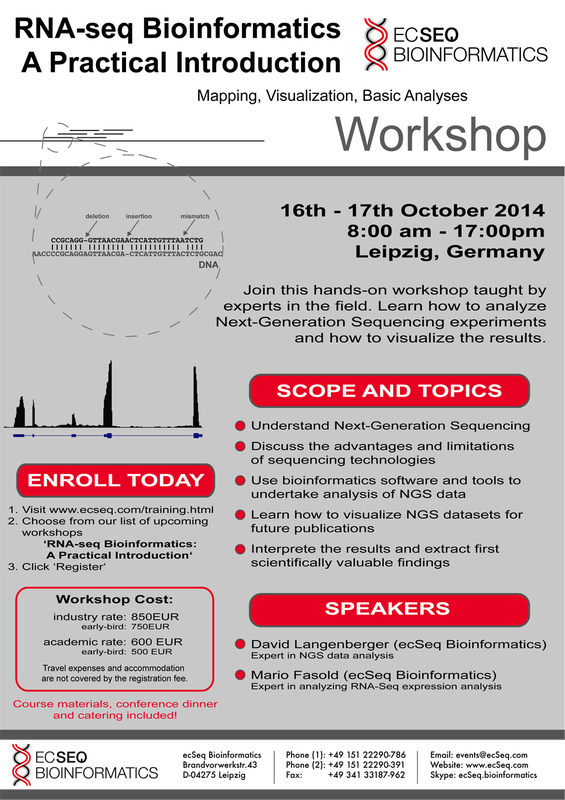 We are very excited to announce that Illumina and Pacific Biosciences, the biggest and the most innovative sequencing machine manufacturer, decided to sponsor our 'Hands-On NGS Data Analysis Workshops 2014'. They will also give short presentations, highlighting great new possibilities in Next Generation Sequencing to our participants. 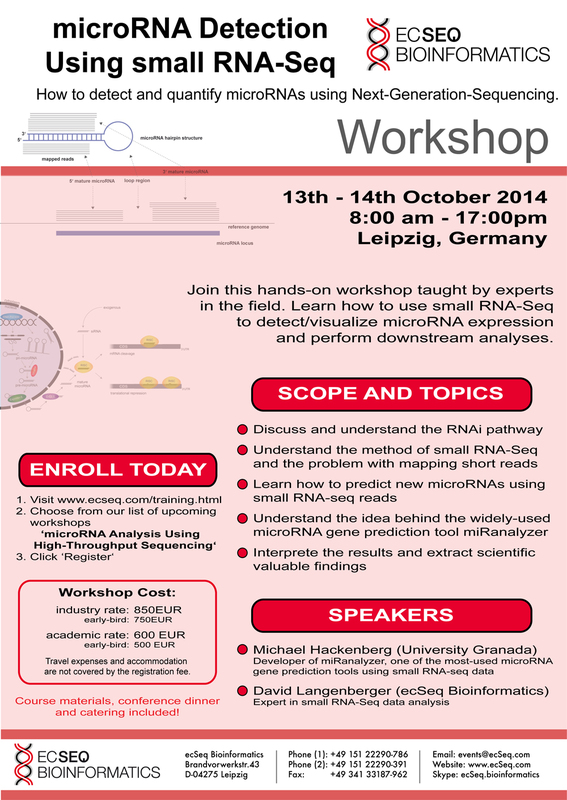 NOTE: Register for more than one workshop and get a 10% discount. Find more information about our upcoming workshops on our website. Save money - Register now! There is an early-bird discount which applies until end of April! Do I need student id to get the academic discount? you don't need an ID. Just apply using your university mailing address, that is enough. Combine your workshop with one or more of our other workshops and get 10% discount.